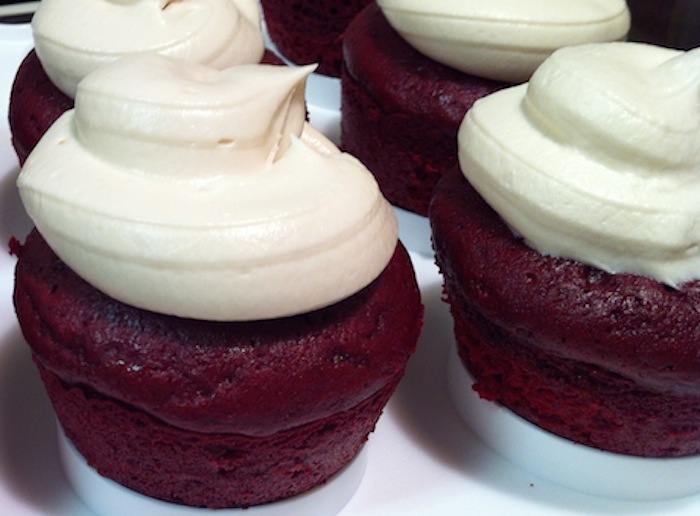 Red velvet cupcakes are so pretty. These cupcakes are vibrant and fluffy and topped with a delicious cream cheese frosting. These colorful cupcakes are great for Valentine’s day, but they’re also pretty enough to glam up any other day too. 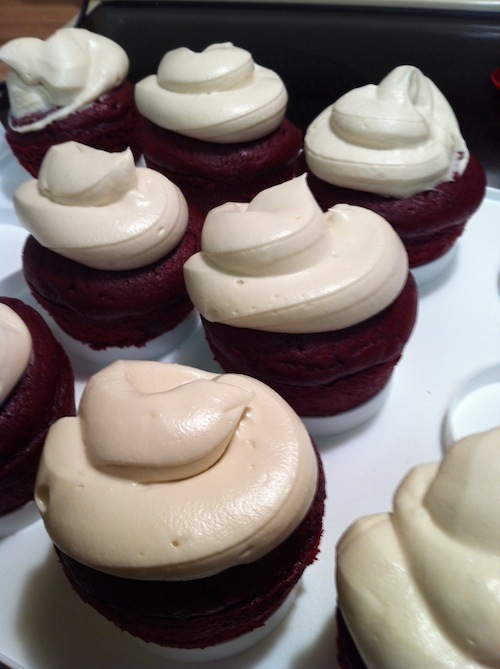 On the other hand, if you have any tips for learning how to pipe frosting, I’m all ears! Preheat oven to 350°F. Grease muffin tins or cake pans well with cooking spray. In a large bowl, cream the butter and sugar until light and fluffy, about 3 minutes. Add eggs one at a time and beat well after each addition. In a separate bowl, mix cocoa, vanilla and red food coloring to make a thick paste. Add to the batter and mix thoroughly. Slowly add half of the buttermilk, then half of the flour and salt, mixing well on low (or by hand) after each addition, then repeat with remaining buttermilk and flour. Add baking soda and white vinegar and beat until well combined. Spoon batter into prepared baking tins. Reduce heat and bake at 325° for 18-23 minutes, or until a toothpick inserted into the center comes out clean. Let rest in the pan for 10 minutes, then place one a cooling rack to cool completely before frosting. Beat cream cheese until smooth, then beat in the butter. Add powdered sugar and then add in the vanilla extract.